Stephan Sobolev is principal investigator in the International Research Training Group "StRATEGy" and holds a professorship in geodynamics at the University of Potsdam. 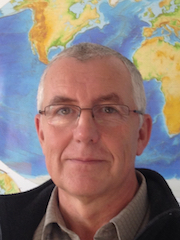 He is head of the Geodynamic Modeling section at GFZ Potsdam. His expertise is in geodynamic, petrophysical, and geophysical modeling and the development of new numerical methods. His research approach is a very good example for how geoscience can work as an interdisciplinary synthesis.